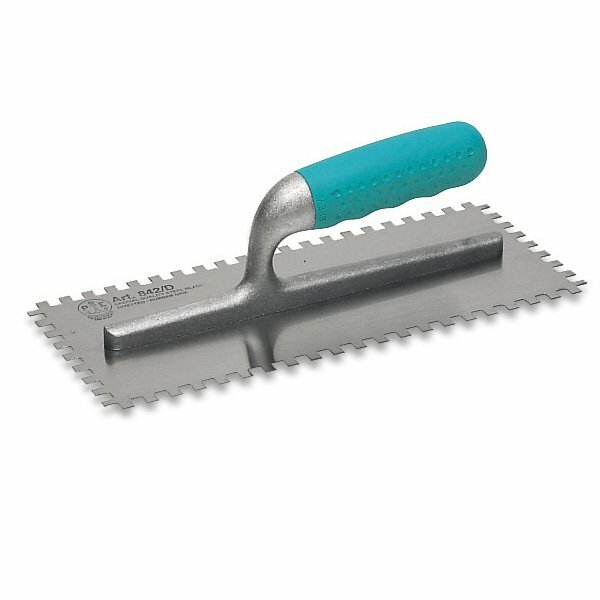 Pavan 841 Notched trowel (841/D-4L) for grooved plaster coats or with tile adhesive. Available in 10 mm x 10 mm or 5 mm x 7 mm notches. Pavan supply welded and riveted special steel finishing trowels. Pavan 841 Notched trowel in the Sintesi model for coating of the handles providing a soft and vibration resistant material creating a special steel blade. The ergonomic design provides a very comfortable grip. Flexibility and toughness are guaranteed by Pavan under all working condition. It is assembled by welding, followed by rigorous testing for load bearing and x-rayed to check correct joining. Finally, the quality of Pavan riveted trowels is ensured by the assembly with ten rivets and the perfect finishing of the blade. Pavan Ernesto & Figli S.p.a. is a family COMPANY located in Arcade near Treviso, rich in history and traditions. The only Italian manufacturer which designs and produces all the components of a wide range of building tools, including trowels, scrapers, brushes and knive. Excl. delivery & VAT. Bulk discounts are available.